Vienna's Ring Road, as the name suggests, goes around the inner city (Innerstadt). It is a semircular road which begins and ends on the Danube Canal (Donaucanal), divided into sections with different names. It can get awfully confusing. After a few times in the city, I finally figured out that all these names, e.g. Openring, Burgring, Schottenring etc., are one and the same road. 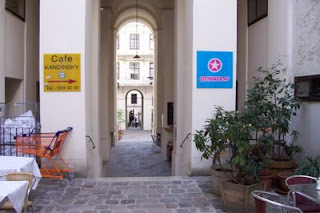 In April 2009, I stayed at a small hotel off Lerchenfelderstrasse, near the Vokstheatre on Museumstrasse. Next block over is the Burgring. The first photo shows the shortcut I took to get to Vokstheatre metro station. It is a former monastery with huge wooden gates, that close at 9:00 pm (I discovered late one evening.) It houses a Kandinsky museum, and a couple of chi chi cafes. Unfortunately, I didn't get a chance to check out the museum nor the cafes. 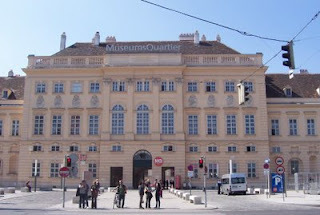 My point of reference was the Museum Quartier (second photo), a complex of 4 museums of modern and contemporary art, including one for Gustave Klimt. 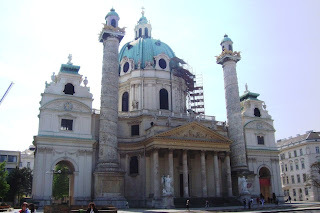 The courtyard of the MQ is becoming to be Vienna's meeting place, with cafes and a fountain. At night, it's the place to chill out for young people..
From the MQ, one can just walk across the Volksgarten to the Museum of Natural History and the Hofsburg Palace. In the palace, one can visit the Spanish Riding School. One side of the MQ, leads out to Mariahilferstrasse, a popular shopping street in Vienna, with many of the same chain stores one finds in a mall. 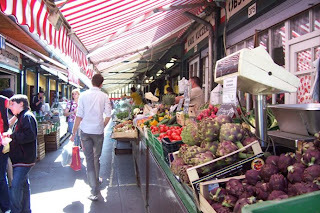 Further on the Ring road, on Openring, is Naschmarkt (third photo), where vendors sell fresh produce and exotic foods complemented by cafes and ethnic restaurants. A few blocks away is the Opera and Karlplatz. Coming out of the Karlplatz metro station, one is greeted with a view of a church with minaret-like towers, Karlkirche. If you keep going along the ring road, you'll get to the Stadt Park. At the Vienna Konzerthaus in the Stadt Park, I had the opportunity of listening to a Strauss concert for 30 Euros. A map of Vienna in Trip Advisor.